They all headed back to the Black Stairs ready for Part 1.5 which I will tell NOW! After the first batch of NPCs were killed in last night's S&W game I decided to make a few more and it was easy. I rolled a D6 plus 10 for AC and a 1d8 for hit points. Blam seven NPCs! Guess what I made five of them dwarves, one human, and one elf fighter and mage. I gave them weapons and Blam I was done in about five minutes. I gave each one a name. Mark the Fighter M Chain and Shield with Sword.The human was a Mastedellian or the main imperial human race. He was a racist who did not hold his tongue and was subsequently thrown down a pit by the Dwarf only to survive for a few more rounds while ghouls attacked. The Band of Dwarves M, Dully, Martrus, Dontar, Dunkin, and Brannoc. All had Ring and Shield with Battle Axes!The five Dwarves were from a clan far to the northeast and they bragged that their caverns had never been taken by goblins much to the annoyance of the PC Dwarf. There was Stryder the Elf Warrior and Mage with Longbow ready to fire.The lone elf was an archer and wizard. He mostly stuck with his trusty longbow. Not to attack the newer systems but I could not do that in less than five minutes like I did with S&W. The party decides to get the heck back to Raven's Keep and right in the servant's quarters they are ambushed by Raph and Tran. Raph and Tran attack with crossbow and Spear and miss! They close in and the Dwarf is killed (CRIT!) by Tran as well as Melenad and Beledad. The cleric is taken out as well as the elf but she does manage to kill Raph. Only Eva the thief is left standing as she fires her arrows at Tran hitting him but he still is up. She drops her bow and draws her sword as the battle axe barely misses. They both make a last strike his axe cutting her nearly to death and her blade hitting the mark killing Tran. She tires to heal the cleric and fails and succeeds on the elf who quickly pours a potion of healing that they found earlier in the cleric's mouth. They limp back to town. 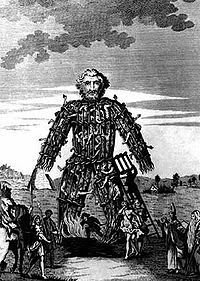 It is said that each year in order in ensure a good harvest the Grain Maiden requires a husband the Wicker Man. She on good years takes any and all such as a slave or criminal but on desperate days she takes a person of pure blood preferably a virgin. Such as the old ways of Raven's Fort. Drunk and stupid the Fighter and the two elf maidens were. The entire group of five hirelings had died in the first three rooms of Bloodrock Castle. The first room was a portrait room with pictures of great art that fell apart when touched. Filthy kobolds ambushed us and killed two of our nameless hirelings. The next room a former bedroom of a rich maiden, has human bandits that wiped out the rest of our retainers when goblins from the third room came in and ambushed from behind. It seems that old school has more deadly consequences than new school gaming. Lucky the players let their retainers die and they had to flee back to the inn to wait for another adventure. They sit there now drinking and regretting the senseless deaths of their retainers. Maybe they will be more careful next time. She is a city that is build upon the ruins of another. No Dwarf woulds do such a thing but the wellspring in the center of the city that flows water as if from the elemental plane of water itself feeds all things in the area an makes them green. The ruins below will give you grief for we warned ye of the goblins and kobolds but we were called stubby little busybodies. Well we will make money off of our steel and will desert your foolish asses when it is unsafe. 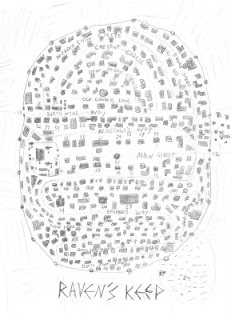 A city of 8000 or more people. I say more than 8000 cause there are many coming from the east escaping the war with the Zezusalonians. Most for work on farms and in the city. A small few are adventurers wanting the gold that lies in these ruined lands. I hope they stir up not the foul things that lay quiet forgetting how evil and powerful they be. Humans have a tendency to stir up ancient and foul beast who end up being a huge problems that we dwarves have to take care of. Stupid humans always wanting to fight for expansion when you can't make what you got at home perfect. Here it is my sandbox map that has been going around in my head for the last few years. 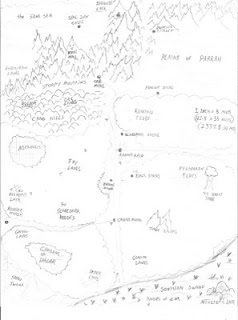 Ever since I went to make a really detailed setting for 3rd edition and found it near impossible due to the length of time it took to create I began looking at the older more simpler versions of the system. I created the Odd Earth concept with the original Odd Guild group on a few postings. Later on with the new Odd Guild members came out with a setting called Odd Earth but I assume forgot to give me credit for the name and initial concept. Their concept of it a dream world of the know world has failed and as it was I that came up with it originally I will now use it in the background for my game world's name. Being that I am unemployed I will most not likely be able to go to Babelcon. I was so hoping to play S&W with the Red Priest I do have one redeeming possibility, with half the gaming group being away at the con I will have the rest play my S&W setting. There has been game CLUNK with the hours long combat in 4th edition. People have began to notice that battles are long and get boring no matter how good the DM is AND we have fantastic DMs. S&W will show these gamers a new way (OR their munchkinisims will come through) that simple can and does work. A Human Fighter and two Female Elves. The Fighter had been traveling for the last 14 days from the Capital to Raven's Keep. A few hours before the city he met up with two female elves. Two Adarian Elves who told a story of the baron of Raven's Keep ravishing an elvish princess of their tribe and now they were at war with the baron. The Fighter groaned as he knew these elves would be trouble. As they approached the city there was a great crowd of people and screams of pain! There was a man burning at the stake! A few rotting bodies hung by the neck from the wall, people in brass pots with only their heads sticking out who would be left to die slowly in their own filth. Stocks of ten with four unfortunates in them, to be left for days outside the city walls and anything could happen to them. Then there was this raven haired girl with bright blue eyes and pale white skin. She wore strange black and red leather armor. She and two guards were at the top of the great stone wall some 20 ft high. She was abut to be hung by the neck until dead. The elves began to complain and the fighter told them this is the law and this is crime and punishment. As they were discussing the girl who was proclaiming her innocence and said she had spurned the baron, was throw off the wall and the noose caught on (1d6 damage) but it did not snap her neck but she would die (1 pt of damage a round) soon. One of the elves pulled out her bow and shot through the rope allowing the girl fall. The rather large crowd went wild and began to run into the town as someone screamed goblins attacking! The elf maidens quickly escorted the girl back into the city where she disappeared into the crowds. The fighter suggested that they do the same. They found a rowdy inn and found rumors of all sorts of things going on. The baron was a womanizer, slavery was very popular here, two dungeons Bloodrock Castle and the Black Stairs beckoned adventureres to explore them and a few adventurer parties had went but never returned. Much adventure was to be found here. A sage of great wisdom invited the party for a drink and told of Bloodrock Castle and a Tome that he wanted for a hefty price. He would tell them of the location and they would return him the Tome.